Announcing our 74th Mainstage Season! 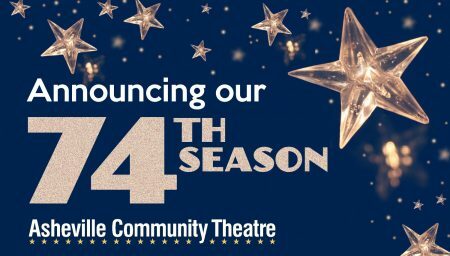 We are SO excited to announce our 74th Mainstage season! Tickets and subscriptions will go on sale later in the spring, but we wanted you to have the first look at what’s coming up next! We’ll also be announcing Mainstage directors and audition dates, Tanglewood Youth Theatre classes, student matinees, 35below shows, the Readers Theatre Showcase season and more a little later – so keep your eyes peeled for all the ways you can plug in at Asheville Community Theatre! This beloved tale, in which a Kansas farm girl travels over the rainbow to discover the magical power of home, has been entertaining audiences for generations. A faithful adaptation of the film, it recreates the dialogue and structure of the MGM classic, though it is adapted for live stage performance. All the songs we’ve loved for years are here including “Over The Rainbow,” “Munchkinland (Ding Dong! The Witch Is Dead),” “If I Only Had A Brain/A Heart/The Nerve,” “We’re Off To See The Wizard (Follow The Yellow Brick Road),” “The Merry Old Land of Oz” and “If I Were King Of The Forest.” This production also commemorates the 60th anniversary of Tanglewood Youth Theatre, which began in the fall of 1959. Kris Kringle is an old man in a retirement home who gets a job working as Santa for Macy’s. Kris unleashes waves of good will with Macy’s customers and the commercial world of New York City by referring parents to other stores to find exactly the toy their child has asked for. Seen as deluded and dangerous by Macy’s vocational counselor, who plots to have Kris committed to Bellevue Psychiatric Hospital, Kris ends up in a court competency hearing. Especially at stake is Susan, a little girl who has a wavering belief in Santa. In a dramatic decision, the court confirms Kris as the true Santa, allowing Susan and countless other children to experience the joy of childhood fantasy. The Fantasticks is a funny and romantic musical about a boy, a girl, and their two fathers who try to keep them apart. The narrator, El Gallo, asks the audience to use their imagination and follow him into a world of moonlight and magic. The boy and the girl fall in love, grow apart and finally find their way back to each other after realizing the truth in El Gallo’s words that, “without a hurt, the heart is hollow.” The longest-running musical in the world, The Fantasticks is punctuated by a bountiful series of catchy, memorable songs and is a timeless fable of love that manages to be nostalgic and universal at the same time. Share this timeless and enduring classic about the March sisters’ journey from childhood to maturity during the American Civil War. Audiences of all generations will enjoy acquainting — or reacquainting — themselves with the sisters: Meg, the eldest; Jo, the high-spirited tomboy; Amy, the self-centered beauty; and gentle Beth, as well as their beloved Marmee and Father. Together the March family learns to endure both good times and bad as they share the joys and pains of growing up. This adaptation skillfully compresses the novel while still including the milestones and ends with Jo’s realization of her life’s work — the publication of her first novel. Elle Woods appears to have it all. But her life is turned upside down when her boyfriend Warner dumps her so he can attend Harvard Law. Determined to get him back, Elle surprises everyone (except herself) when she applies to and is admitted into the prestigious law school. While there, she struggles with peers, professors and her ex. With the support of some new friends, Elle quickly realizes her potential and sets out to prove herself to the world. A fabulously fun award-winning musical based on the adored movie! Playwright Neil Simon got his first big break in the early 50s as a staff writer on Sid Caesar’s Your Show of Shows, and this comedy takes a fictionalized look into writer’s room antics. The play focuses on Max Prince, the star of a weekly comedy-variety show circa 1953, and his staff, including Simon’s alter-ego Lucas Brickman, who maintains a running commentary on the writing, fighting, and wackiness that takes place in the writers’ room. It’s an insider’s look at the personalities and processes of television comedy writing, as well as a reflection of the political and social undercurrents of its time.